One beautiful afternoon, Aphrodite, Goddess of Love, and her son Eros were having a picnic by the Euphrates River (the Euphrates Rises in Turkey, crosses Syria, and enters Iraq where, in the south, it unites with the Tigris to form the Shatt al-Arab. It is 1,700 miles long). Suddenly, the hideous monster Typhon appeared out of nowhere. Typhon was the youngest son of Gaea (the Mother Earth). He possessed a hundred fire throwing heads and his body writhed with poisonous snakes. Tall enough to touch the heavens, his horrifying shrieks drove even gods insane. Immediately, Aphrodite and Eros leaped into the river transforming themselves into fish to swim faster. The story of Piscis Austrinus is identical to this story; some people say Piscis Austrinus' fish is the mother of Pisces' fishes. The story is also similar to the Capricornus story with Pan (the god of flocks, shepherds, forests and wild life) at the River Nile. 48k GIF.Photographer's notes: The bright Sc spiral galaxy NGC628 (M74) in a pseudocolor V-band image taken with the Lowell 1.1-meter telescope. This is an excellent example of the subtype dubbed Sc(s) in the de Vaucouleurs extension of Hubble's galaxy classification, in which the arms arise in a spiralling pattern from the nuclear region itself rather than from a surrounding ring. M74 is a mag. 10, 10.4'x9.5 spiral galaxy located 1.3° ENE of eta Piscium. Unusual for a Messier, Dreyer calls it faint, yet easy to resolve. A sharply defined core. NGC383 is brightest	(mag. 13.4) and one of the biggest (1.6'x1.4') of a chain of 8 galaxies in Pisces, located 1.1 ° NE of Sigma Piscium. 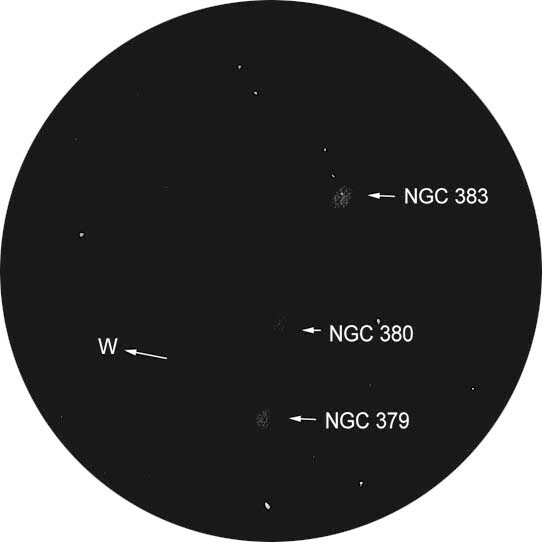 Two other galaxies to the north are NGC379 (mag. 13.9 & 1.4'x.8') and NGC380 (mag. 13.6 & 1.4'x1.2'). A 6" might be able to reach 383 and 380. The rest require bigger scopes. NGC386 to the south is mag. 15. 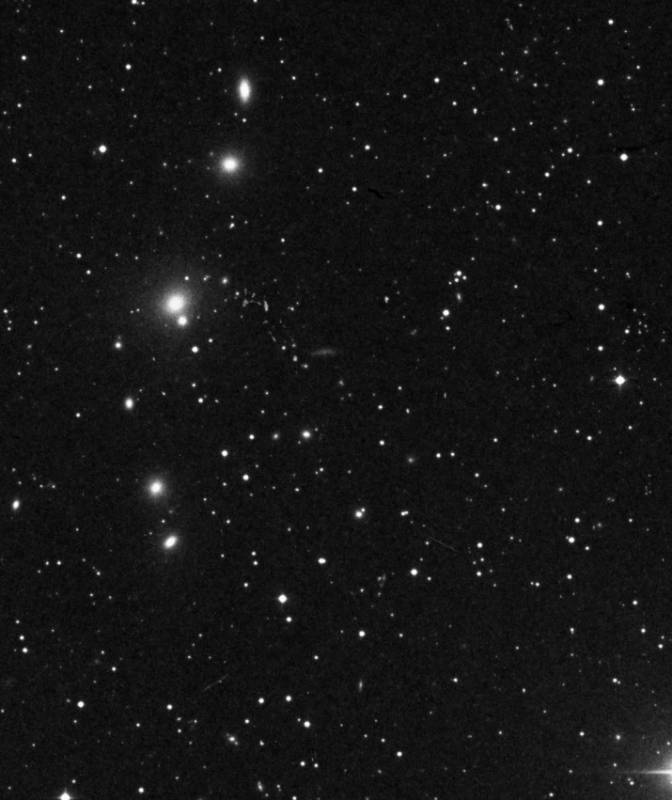 The larger NGC375 is mag. 15.2. NGCs 384-5 are both mag 14.1. NGC388 is mag. 15.1. The bigger the scope, the greater your chances. The first image is from the Digital Sky Survey. A detailed map accompanies it. The third image is a slightly enhanced sketch by Bert Dekker made from views in a 6" Newtonian. His advice is good for many of these objects: Don't be afraid to throw magnification at them. Click here for a detailed map better suited for use in the field.